Research presented at the 2014 annual meeting of the American College of Sports Medicine showed fat % measured with the FLOATAWEIGH was highly correlated with data from a tank-mounted underwater weighing system. 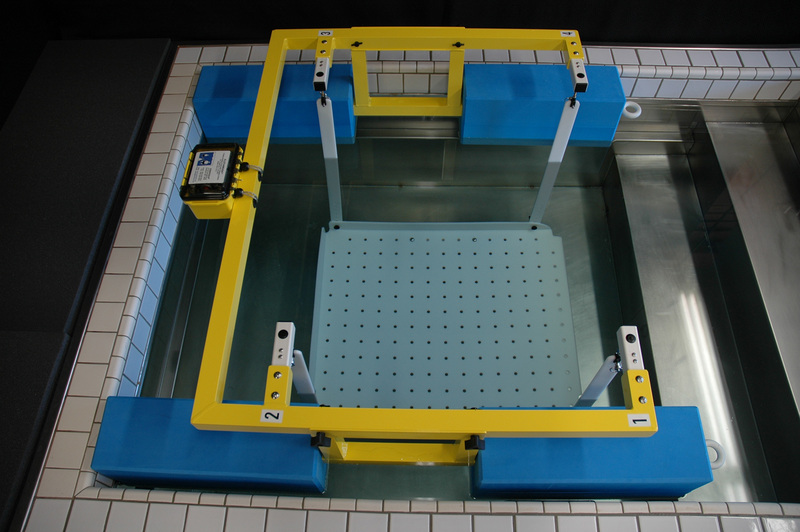 Hydrostatic weighing is considered by many a gold-standard method of assessing body composition. Limitations to using this method include, but are not limited to, space for the water tank as well as the additional cost of the tank. To circumvent these limitations, a novel apparatus has been developed that can be used in a swimming pool which is more widely available, without the additional cost of a water tank. Purpose: To evaluate the validity of a novel, floating hydrostatic weighing apparatus (FLOTAWEIGH) in a swimming pool against a traditional fixed hydrostatic weighing system found in a typical laboratory water tank. Methods: 34 healthy subjects (19 males, 15 females), acting as their own controls, were assessed for body composition using the floating apparatus compared to a standard fixed apparatus in a typical hydrostatic weighing tank. Both apparatuses have identical structure, load cells, electronic sampling patterns (43 samples/second) and software. The devices differed only in their environment of weighing, one floated freely in a pool while the other was fixed within a water tank. Results: The % body fat (%BF) means (±SD) are 16.3% (± 6.5%) and 16.8% (± 6.7%) for the pool and tank apparatuses respectively. The %BF range for our subjects included 6.1% (5.4%) – 27.3% (27.6%) in the tank (pool). We found a significantly positive correlation (y = 0.9997x + 0.5013) between the two devices resulting in an R2 = 0.9416 (p < 0.001). On average, the tank resulted in only a 0.5% greater body fat percentage compared to the pool. Discussion and Conclusion: The results suggest that the new hydrostatic weighing system correlates well with the fixed version in the controlled environment of a water tank. The new floating apparatus adequately overcame the below-water current perturbations inherent to most swimming pools due to water pumps. The clinical significance is that the FLOTAWEIGH measured our subjects very closely to the fixed version with a 0.5% difference in body fat. These results support the validity of the new FLOTAWEIGH apparatus for body composition assessment.